Coastal Carolina head coach Gary Gilmore, who is entering his 20th season at his alma mater, has seen the Coastal program continually rise in the world of college baseball to a national power and the 26th-year head coach ranks among the NCAA's all-time top 50 in wins with 1,006. . Under his guidance Coastal has made 13 NCAA berths, twice advancing to a Super Regional, featured numerous draft picks - including 13 players drafted within the top 10 rounds over the last seven years, and built perhaps the best overall practice and playing facilities in the nation. Kevin Schnall -- a Coastal Carolina assistant coach for 12 years (2001-12) and a member of the University's Sasser Athletics Hall of Fame -- returned to the Chanticleer baseball staff as associate head coach in July of 2015. Schnall served on the University of Central Florida baseball staff for the past three years (2013-15) as the Golden Knights' hitting instructor and recruiting coordinator. With Coastal, Schnall will resume his duties as recruiting coordinator, a position he held down his final seven years at CCU, as well as work with the Chanticleer catchers and provide hitting instruction. In the fall of 2012 -- between his time at Coastal and starting his first season at UCF -- Schnall was listed among the top 10 assistant baseball coaches in nation according to a poll of Division I head coaches by Baseball America. Schnall began his coaching career at his alma mater, Coastal Carolina, and served as an assistant on Gilmore's staff from 2001-12. The Chanticleers made appearances in the NCAA Tournament in 11 out of his 12 seasons on the staff, while advancing to the Super Regionals in 2008 and 2010. The Chants earned four #1 seeds at NCAA Regionals and were the national #4 seed in 2010. In those same seasons, Schnall also aided Coastal Carolina to eight Big South regular season championships and eight Big South tournament titles. Drew Thomas begins his ninth season with the Coastal Carolina University baseball program as the pitching coach. His first five seasons were spent as a volunteer assistant on the baseball staff before being promoted to a full time post in the fall of 2011. In his eight seasons, Coastal's pitching staffs have led the Big South in ERA five times, ranked among the nation's top 20 five times and ranked among the nation's top 12 in fewest hits allowed per nine innings four times. Also, since the end of the 2008, a Chanticleer has sat atop the Big South career ERA list as Joey Haug (2007-08) finished with a 2.54 ERA, Anthony Meo (2009-11) finished with a 2.52 ERA and current record-holder Ryan Connolly (2010-13) finished with a 2.23 ERA. Thomas came to Coastal Carolina from the IMG Academies in Bradenton, Fla., where he had worked since 2003. He was the roving pitching instructor for the Florida Collegiate Instructional League and also was the pitching coach for the Pendleton Academy. Thomas helped develop Chris Perez, a first-round draft pick by the St. Louis Cardinals in 2006, and also worked with former Chanticleer Steven Carter. Thomas was a private pitching instructor in Springfield, Ill., from 2001-02. He also was the head coach of the Mason County Legion in Springfield. He pitched in the San Diego Padres organization in 1998-99, and played for the Canton Crocodiles of the Frontier League in 1999-2000. While with the Crocs, Thomas was the 2000 Frontier League Relief Pitcher of the Year, a League All-Star, and a second team Baseball America All-Independent Team member. 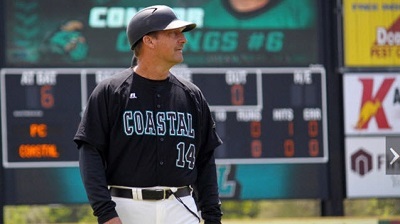 Matt Schilling, who played at Coastal Carolina from 1993-94 and coached the Chants from 1995-00, returned to his alma mater to serve as a volunteer assistant baseball coach in summer 2012. Schilling is in his third season in his second stint on the Chanticleer staff. He coaches the infielders, is the first base coach and works with the hitters. Schilling will also serve as director of Chanticleer Baseball Camps. Coastal Carolina infielders led the Big South by turning 57 double plays in his first season back with the Chants and Connor Owings, who played first, second and third in 2014, was named first team All-Big South as a utility player. Between his time at Coastal, Schilling spent 12 years as the senior director of on-field instruction at the Baseball Factory in Columbia, Md., which is one of the - if not the - premier recruiting services in the country. In his stint with the Baseball Factory, Schilling served three years as an associate scout with the Atlanta Braves, working under current Kansas City Royals Assistant General Manager J.J Picollo. At the Baseball Factory he worked one-on-one with many future college and professional players including Giants infielder Manny Burriss. He also worked, organized and ran various Baseball Factory events that featured future big leaguers David Wright, B.J. Upton, Gavin Floyd, Delmon Young, Will Rhymes, Chris Perez and Derek Holland, among others. As a student-athlete at Coastal, Schilling played for then head coach John Vrooman and led the team in hitting in both the 1993 (.331) and '94 (.356) seasons. Schilling earned first team All-Big South honors as a second baseman in 1994 and was a nominee for the Rotary Smith Award, which goes to the nation's top collegiate player. In 1993, he helped the Chants win the Big South regular season championship. He additionally was a member of the soccer program. Schilling was an assistant for Coach Vrooman one season and stayed on for the first four seasons of the Gary Gilmore era. In his final season in Conway, the Chants posted a 43-15 overall mark and went 10-2 in league play to win the Big South regular season title.